Your mom is wrong, pointing is not rude, it's a matter of life or death. Point and click adventure games have a special place in my heart being that my introduction to PC gaming was the result of getting King’s Quest IV for Christmas back in the days before girls were more interesting than Legos. Unfortunately, the genre tends to get overlooked by the fiery-blooded youth of today’s gaming world. While that super hot life juice exists in me as well, sometimes quick trigger reflexes need some R and R, allowing the problem-solving portions of one’s brain to swoop in and go a couple of rounds with the denizens of the gaming world. 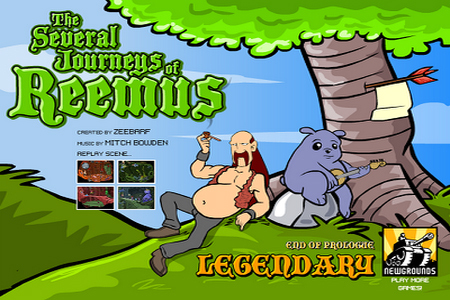 The Several Journeys of Reemus is a great game to assist with this vacation from direct confrontation as it allows for some simple pointy/clicky escapades through the wild and wacky world of medieval exterminator, Reemus and his closest friend, the purple bear known as Liam. These two would-be adventurers don’t exactly fit the mold of most thrill seekers, but that doesn’t prevent them from questing around, fighting all manner of killer pests and putting their hands into slimy things that look a lot like buttholes. The series is broken up into five parts, each one with its own unique setting and challenges, such as a a journey into the nest of the horrifying ant queen and the arrival of an alien race of evil slugs. It’s a really funny series but one that should not be taken lightly as the puzzles can be a bit tricky at times (not for me though, my brain is huge). 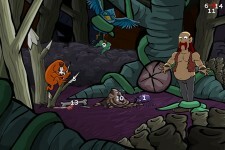 For those that enjoy the free series, Click Shake Games has recently released the first premium Reemus and Liam adventure called The Ballads of Reemus: When The Bed Bites. I plan to pick up a copy as soon as I finish the fourth chapter of The Many Journeys, though some in-game bureaucracy is making that quite difficult. Cheap and Dirty Gamer: I Want to Crush the Castle… Adventures?